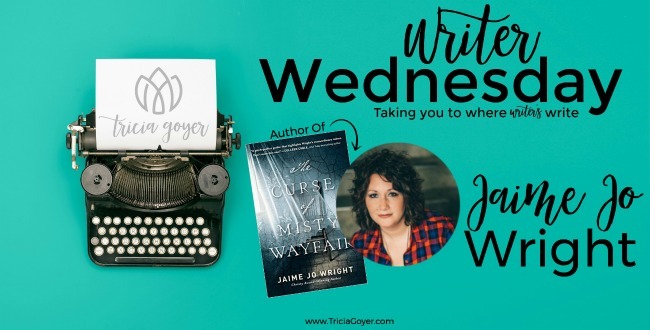 Today on Writer Wednesday we welcome Jaime Jo Wright, author of The Curse of Misty Wayfair. 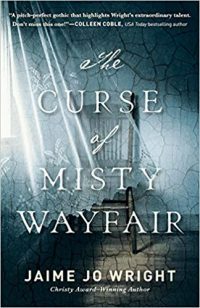 Enter below for a chance to win a copy of The Curse of Misty Wayfair! Winner announced right here next week. Note: This post contains affiliate links. 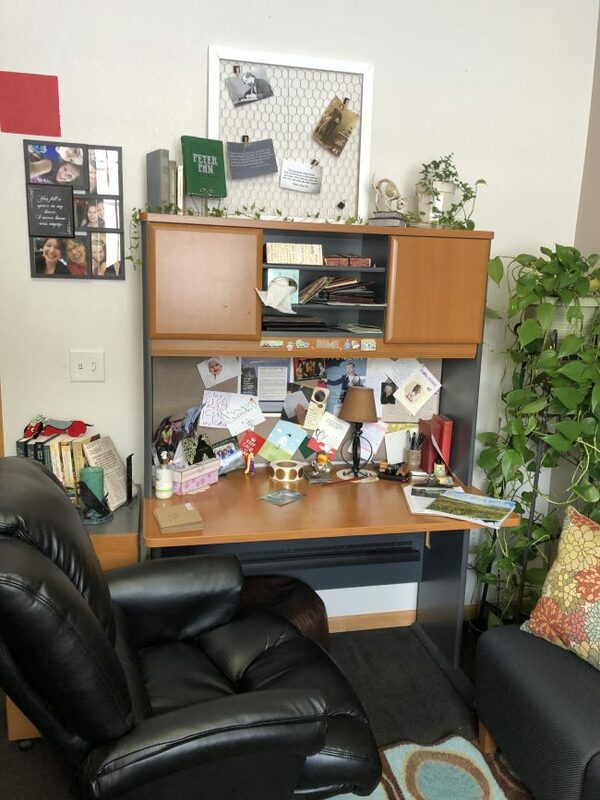 Jaime Jo Wright the author of the new book The Curse of Misty Wayfair shares her writing space on today’s Writing Wednesday! This is one of my several “workspaces”. I’m a mobile writer and I don’t do well in one spot for days on end. The picture included here is at my office (day job). My boss is gracious enough to let me work on my books during breaks or downtime, and since I’ve been here for well over 15 years, it’s really my office-cave. Complete with a custom red wall, Edgar A. Poe paraphernalia, and tons of books. I also have an office at home. That one is probably one of my favorites because my huge white, leather chair and ottoman come with a fluffy white cat I call my “Foo-Foo”. It also has great natural lighting, gray walls, and lots of sunshine yellow highlights throughout the room. Realistically, a lot of my writing takes place at my local coffee shop owned by my third cousin. They make to-die-for coffee and it’s just fun to sit in a central place in my community, wave at people I know, and study people I don’t know … mwahahahah! Last but not least, I often can be found writing on my couch in my living room, or in my gramma’s chair by my living room window. Surrounded by, hollering children, the chaos of a weekend at home, my husband going in and out, and me yelling for my daughter to refill my coffee. It’s chaos, but I love it. Jaime Jo Wright the author of The Curse of Misty Wayfair. A century later, Heidi Lane receives a troubling letter from her mother–who is battling dementia—compelling her to travel to Pleasant Valley for answers to her own questions of identity. When she catches sight of a ghostly woman who haunts the asylum ruins in the woods, the long-standing story of Misty Wayfair returns–and with it, Heidi’s fear for her own life. I just finished The Reckoning at Gossamer Pond. I could not put it down until I finished!!!!! Can not WAIT to read this! A wonderful book! I loved it. Just read this from being on Jaime’s launch team. After Jaime Jo Wright won the Christy award, I bought two of her books. 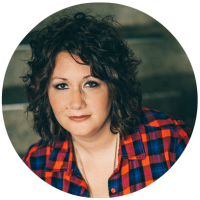 Her depth of character arcs and writing style have earned her a place in the hearts of her readers. This book sounds very intriguing! I haven’t read any of Jaime Jo Wright’s books yet, but I look forward to the opportunity. I have seen outstanding reviews for this book and it has me most intrigued. I read her first book and was impressed. I would love to read this.Thank you for the giveaway chance. This is on my list to read this year! I have read one book by this author and now I am a new fan! Sounds intriguing, would love to win a copy. I love reading. This is a book I would enjoy reading this winter. Jaime is a new author to me and I have heard great things about her books! This book sounds so engaging and haunting! I can’t wait to read it! Thanks for the giveaway!